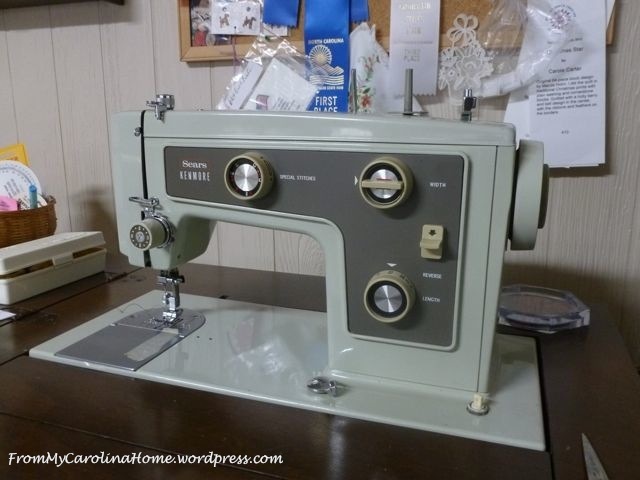 I have several old workhorse machines in the sewing room. 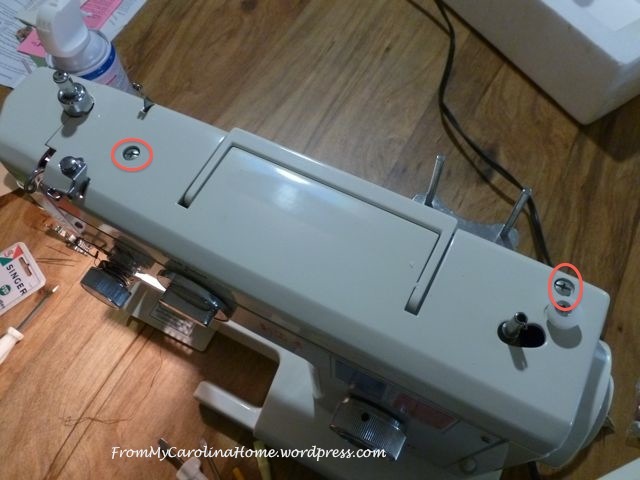 As I was taking one apart a day or so ago, it occurred to me that this is such an easy thing to do, but most sewing enthusiasts are scared of it. Truly, if your machine is older, out of warranty, you have nothing to lose by trying to make it run better yourself. 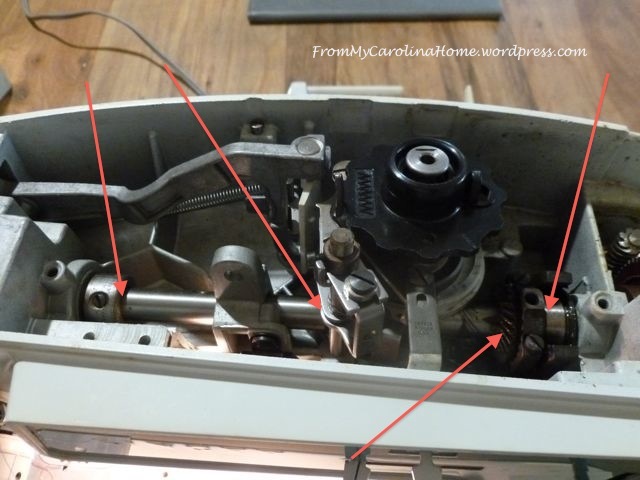 So, here is how to fix an old machine making strange noises, or maintain an older machine so you can continue to get good service from it. Right now I have two older machines from the 1970s that I am going through for a friend. He wants to sell them, so I am making sure they run nicely and make good stitches. 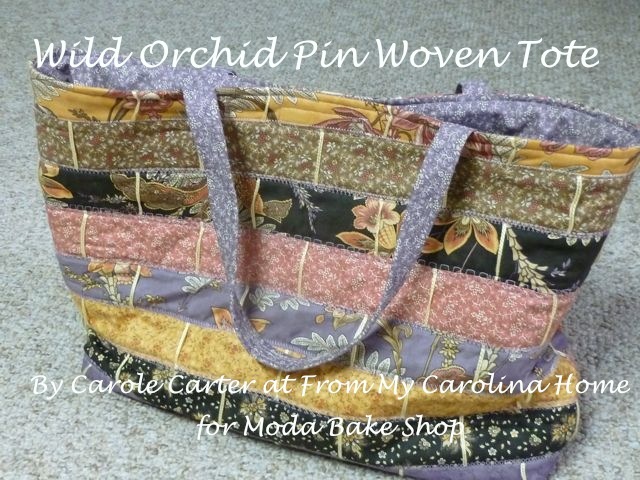 One is an old Singer Touch and Sew, the other is a Necchi 535FA. I’ll also show you my 1972 model Kenmore that I have taken apart many times. I have serviced several older rough running machines for a charity too, and this method has worked every time. If this doesn’t fix your problem, then you can take it to a service person, as there may be a broken part. I have only had to do this one time in more than 30 years of cleaning my own machines. One caution, if your machine is electronic with lots of computerized goodies, don’t do this unless it is old as the hills and you have nothing to lose. Electronic machines are quite a bit finickier, and there is more to mess up. If you cannot easily take the cover off and look inside, leave it to a professional. In this tutorial, you’ll see three very different machines with one thing in common – the mechanism for almost all machines is the same. It is a series of gears and pulleys, with some pistons that ride along a bar. I would guess that the great majority of machine issues are simple dirt and lack of oil and grease in the right places. 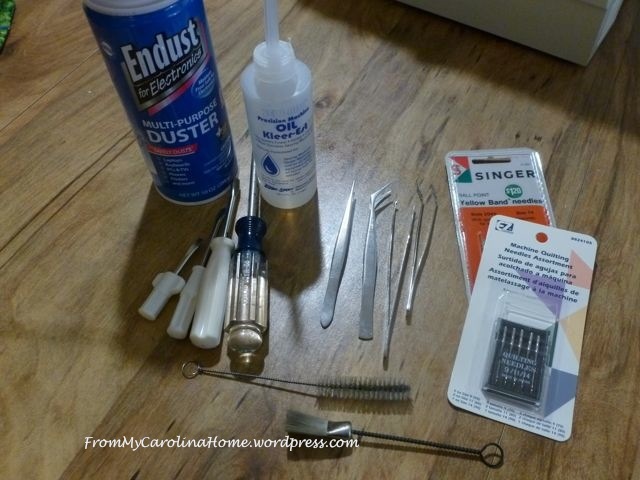 Most clunking noises and squealing are simple cleaning issues. 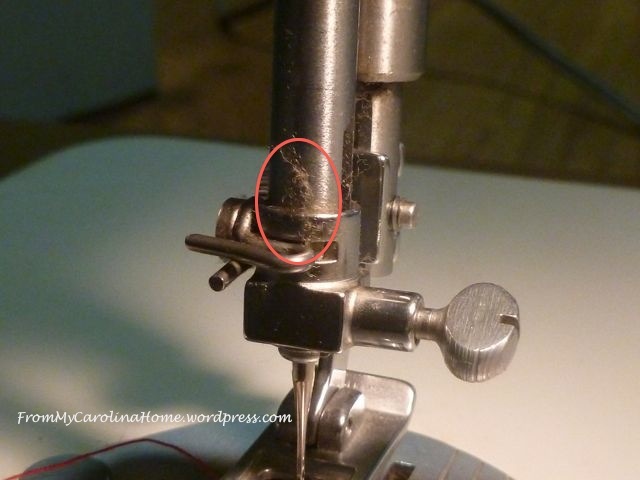 Tension problems and thread breakage are often caused by dirt or stray threads in the bobbin race. First, remove the needle and the presser foot. Raise the presser bar. Take out the bobbin case. 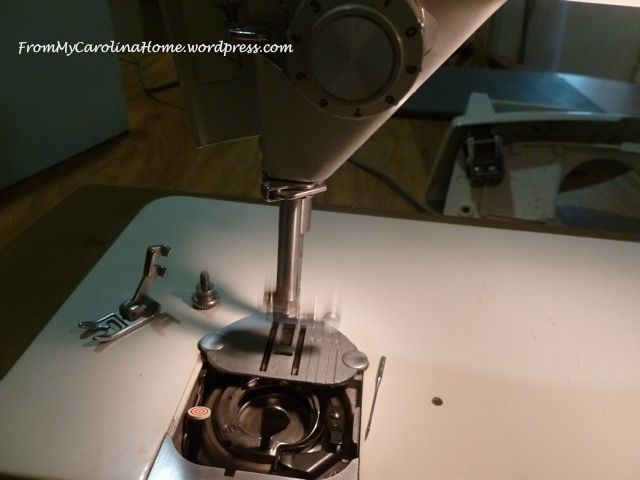 This will allow us to move the gears without damaging the bobbin case or the presser bar. Blow out the bobbin case with air, remove any stray threads, and put a drop of oil on the mechanism where the parts slide over each other, keeping it out of the area where the bobbin sits. I have sometimes used dental floss to clean this area thoroughly. 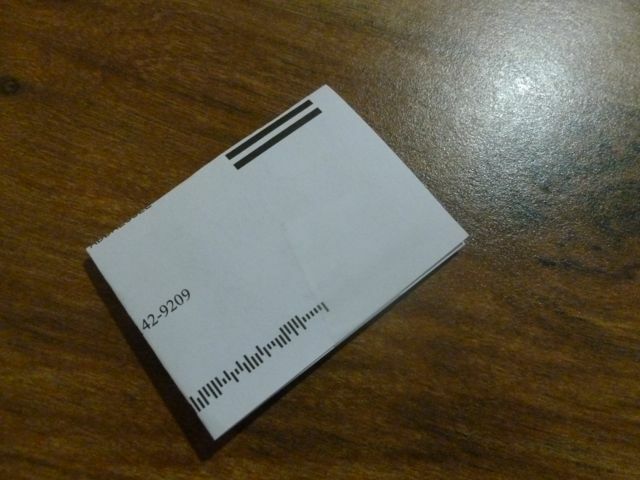 To safely discard a needle, tape it to a cardboard card (I use the blow in magazine inserts for this), then fold the cardboard in half and tape again. 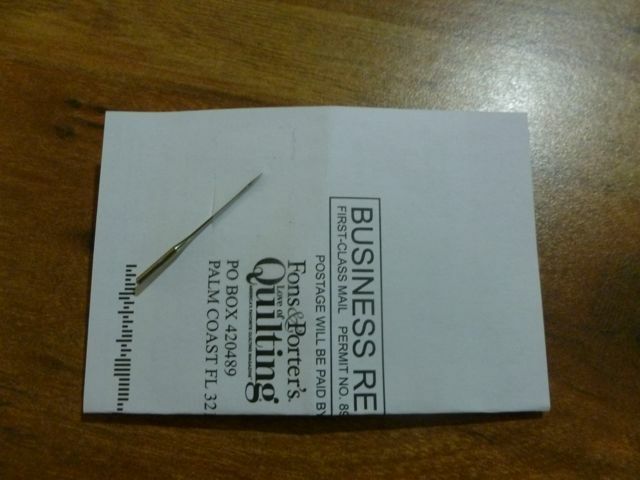 You will want a new needle after this anyway, so discard one that might be part of your problem. Next, take off the top cover. This is usually very easy with only two screws. 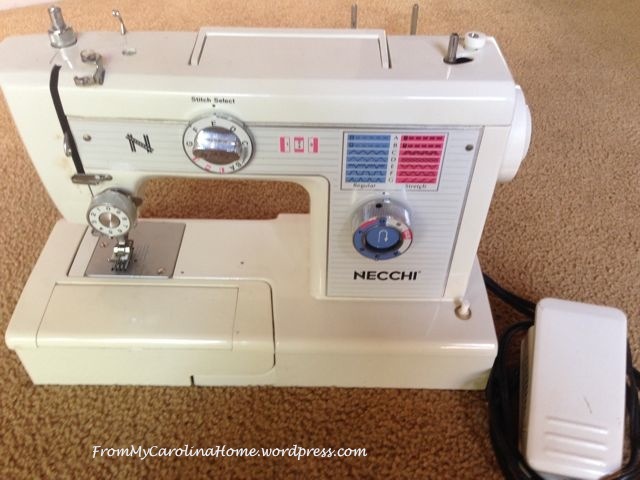 The only machine ever to defeat me was my friend Carolyn’s Pfaff, we never did figure out how to get the cover off that one, even with an internet search! Pfaff just doesn’t want you doing this. But I have a Pfaff 7570, and I want to be able to service it, so I’ll keep trying. But that’s another post, LOL!! Done!! Click on Pfixing the Pfaff. So, locate the two screws that will allow you to lift off the top and unscrew them, setting them carefully where you won’t lose them. Sometimes one will be under the handle. I use a little dish to hold the screws. 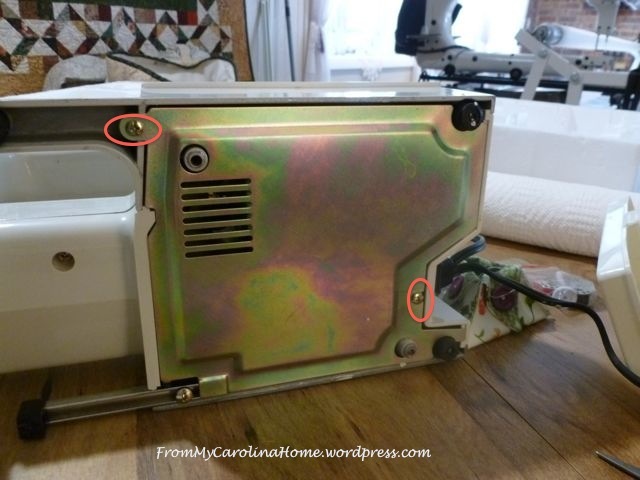 Do not remove the screw holding the bobbin check in place, it isn’t necessary and is a pain to get back in the right place. See all those gears and moving parts? They need to be cleaned off, and regreased or oiled. I use the blue gear grease. All those spots where there are parts moving against each other need oil. 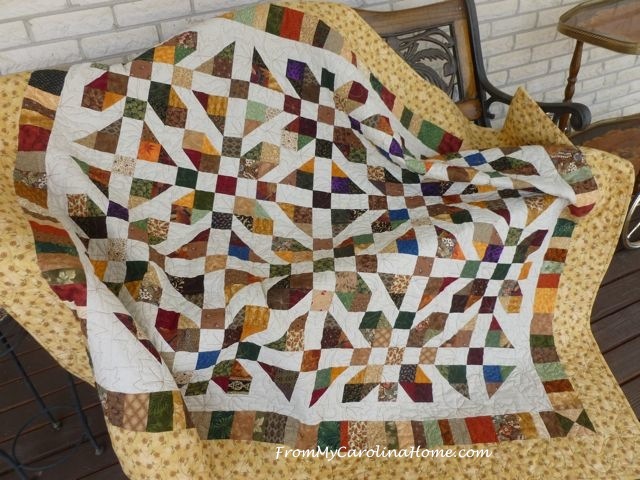 Only use sewing machine oil, it is clear and has a low odor, and it will not stain your projects should a drop happen to land on some fabric. To find where you need to put some oil, turn the hand crank back and forth and watch the moving parts. If your machine has cams like this one, remove the cam and clean under it too. Use only a couple of drops in each point. Use what you need, expect some drips but don’t overdo it. Sometimes you will find little holes to allow the oil to reach under the moving parts. Just put a drop in there. Be sure it is an oiling port, not a set screw (won’t hurt anything just won’t help to put oil on a set screw). Clean off the rods, oil the parts that move. There will likely be gunk in lots of places, so use a tiny bottle brush, and a nylon brush to get out the crud. Once you have wiggled the hand crank, found and oiled or greased all the parts that move against each other, then go to the next area. 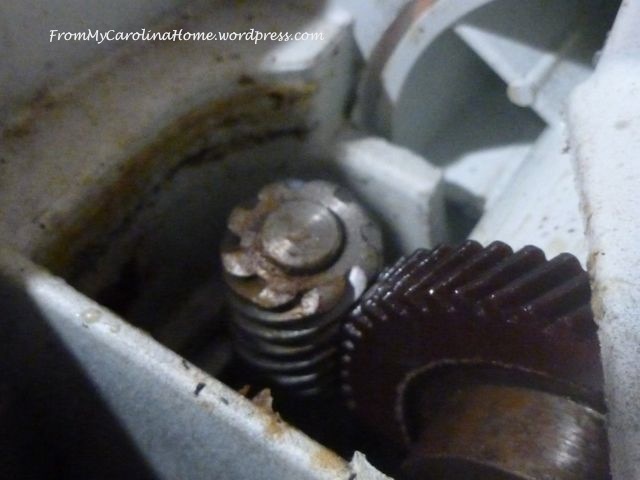 In general you will want to grease gears like the picture above, and oil everything else. With some machines, you will need to get underneath to get to the last rod and piston assembly. Don’t be afraid. Just lay the machine on its back, and remove the two screws holding the bottom plate. My Kenmore doesn’t have a bottom plate, all the parts underneath are easy to reach. Clean and lubricate the gears and pistons in this area as well. One caveat, do not get any oil on the belt from the motor to the first gear. That will cause the belt to slip and your machine will run but not make stitches. 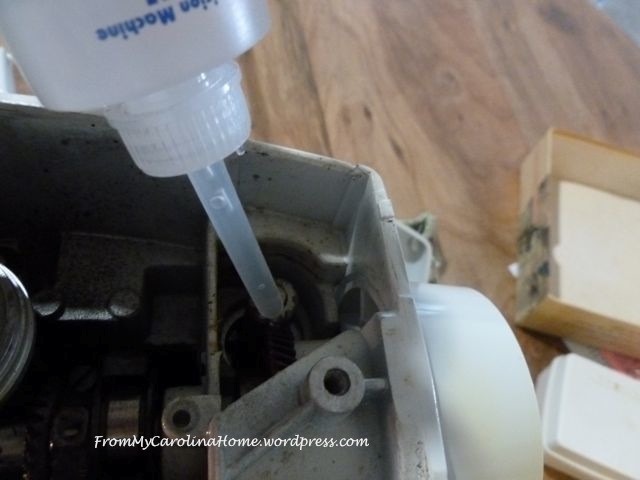 If you think you got oil on it, turn the hand crank while you thread a paper towel under the belt to soak up any oil. Look around for any other gears or moving parts, remembering to stay away from the motor belt. Replace the bottom plate, and stand the machine back up. Pop off the cover over the light bulb. 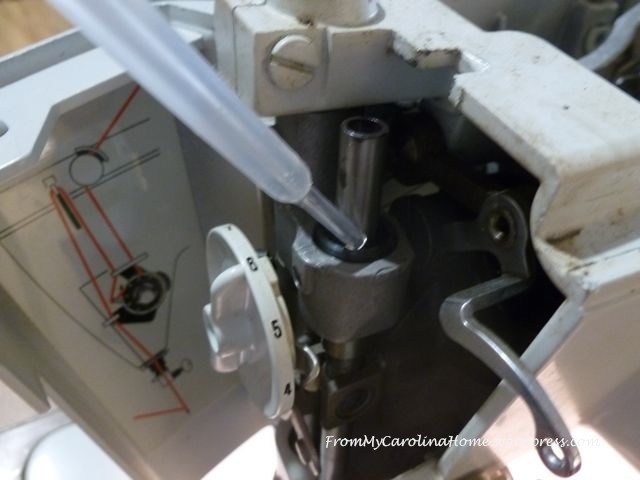 There is a rod there as well that the piston moves on to make the needle go up and down. Clean off any gunk, then put some oil on the the piston so it slides easily. Turn the hand crank to watch it. When you think you have all of it oiled, plug in the machine and turn it on. Step lightly on the foot control to listen to it work. If it sounds smooth, increase the speed. If you hear a clunking noise, or a squealing, there is something you missed with the oil or grease. Go back to the hand crank and follow all the moving parts to figure out where the noise is coming from. Inspect it carefully and remove any gunk, then oil. Then go back to the foot control, and increase the speed until you are pedal to the floor and the machine is running at its highest speed. Don’t worry, this won’t hurt it, but it will be sure that all the oil is distributed. If all sounds good, place a paper towel under the presser bar, and let it sit for a day to allow any excess oil to drain out. Wipe off the excess oil inside and out so it won’t collect dust and become gunk in the future. 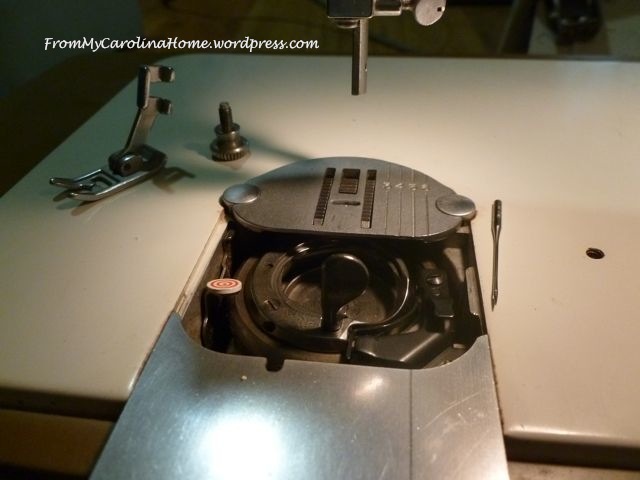 Replace the covers, replace the presser foot, insert a new needle and you are ready to go. 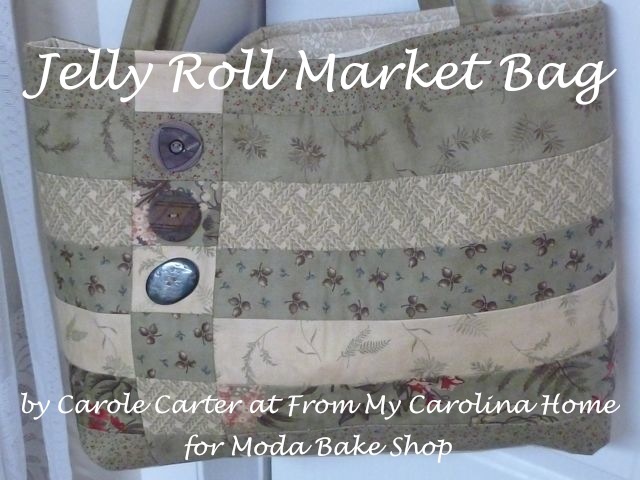 When you are done, thread it with different colors of thread in the top and bobbin and check your stitches. You can adjust the tensions to create perfect stitches if you know which one is the problem. I hope you find this useful for your older machines. The three I have used in this tutorial are all 40 years old or older. Featherweights are the same for oil and gear grease, except you can only reach the parts from under the machine and on the left side. 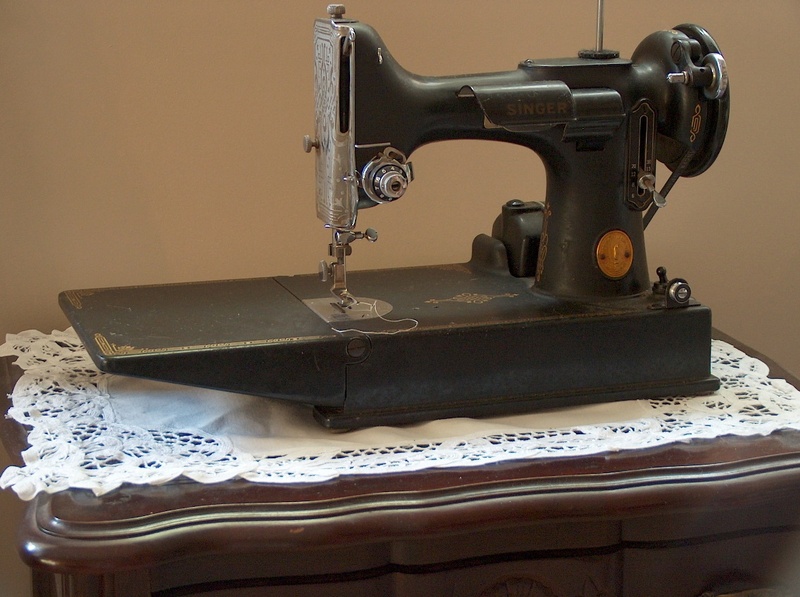 My Featherweight still sews beautifully and it is over 70 years old. The wonderful thing about these older machines is the parts are all metal, and will last forever, unless a gear breaks. So don’t be afraid to open up your older machine and take a look. That noise you hear, or the rough running is probably a bit of crud on a gear or a rod that you can easily take care of yourself. Serenity Now Weekend Bloggy Reading. Thank you SO MUCH for taking the time to write this post. It can be absolutely intimidating to clean my own machine- so much so that I’ve probably delayed it too much! The pictures were all especially helpful, too! I’m so glad you found it useful, thank you for the very nice comment! 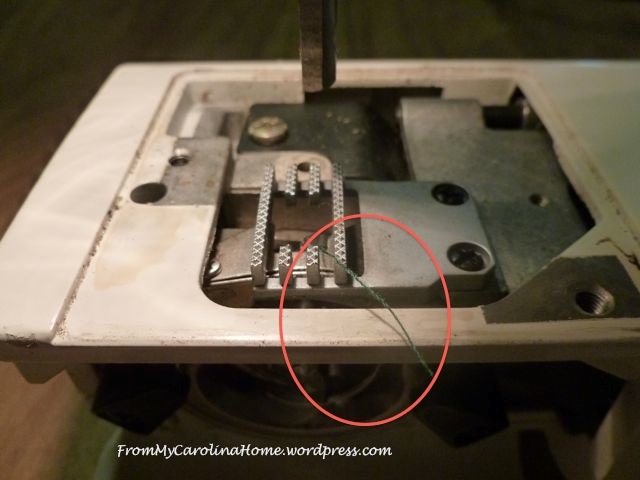 I have a Janome Gem 639, about 20 yrs old – I have to take off the bobbin winder screw in order to get the top off – do you think it is safe to do that? I don’t want to undo something inside that I can’t put together again. I really love this tutorial – thank you so much!! 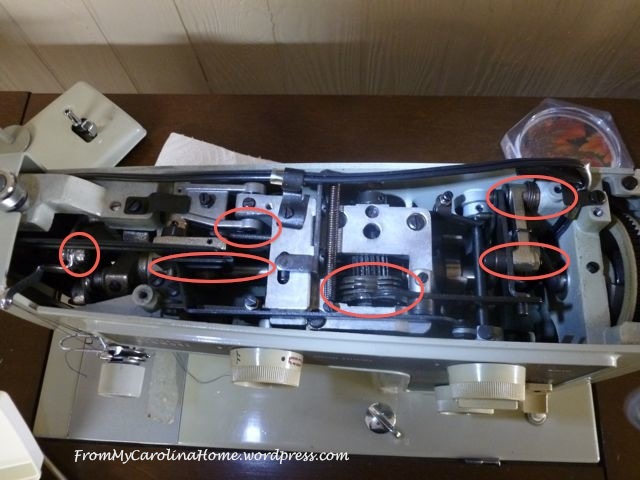 I have never seen a machine where the bobbin winder screw was part of the top assembly. 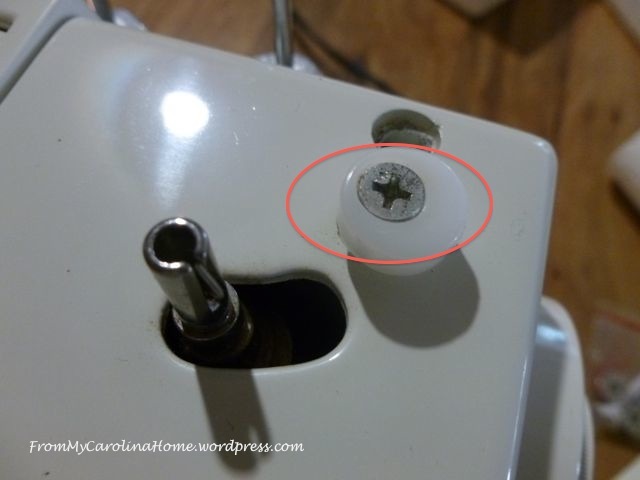 Have you tried removing the top without taking that screw out? Usually there are two screws, other than that one, that hold the top on. 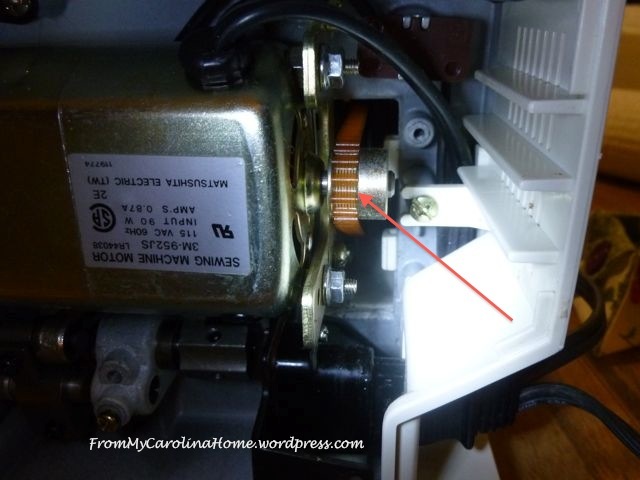 Sometimes the second screw is hidden under a flange or under a handle and it will fool you into thinking the bobbin winder screw has to be removed. However, I am not familiar with that particular machine. The thing with taking it off is sometimes a little part will fall down to the bottom of the machine, and sometimes it is difficult to get it back on in the right place. Overwinding bobbins can cause thread nests on your projects and a mess inside the bobbin case. I have 7 now. 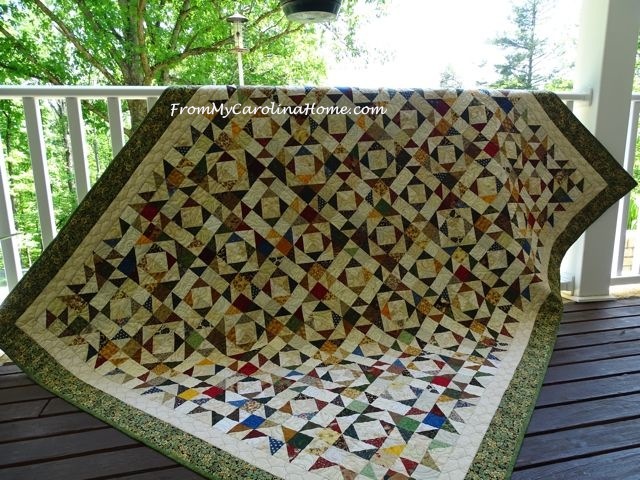 I want a Featherweight, but …. I will wait. I just got a 15-91 from a friend. That one needs all new wiring. Hubbs and I will do that after all the other stuff we have to do. Anyway, I wanted to mention some great idea I came up with. Old mascara brushes. I toss the old container of course, then clean off the brush with paper towel to get all of the old mascara off. Then with a tooth brush I clean it really well with Dawn dish soap. Of course the brushes have to be the bristly brushy kind, not plastic. I clean them often and keep them handy in my tool drawer. I don’t think I would do this, those brushes are not meant to last forever and you run the risk of little brush parts ending up in your gears. You can buy tiny inexpensive bottle brushes at the hardware store. 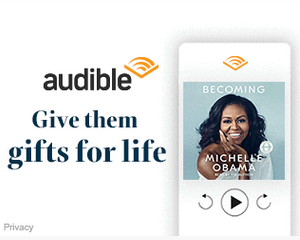 Oh, I have been using them for yeeeeeears. They work great for getting the fuzzies out. Maybe you mean the type of brush. My mascara brushes are pretty fluffy from oh gosh, mabeline or something. they are actually less brittle than the plastic fiber brushes. Try it!! I forgot to say, my sister has that SAME Kenmore. I cleaned it up for her last year. She was having trouble with it and says it is a crummy machine. She is, of course, wrong. I told her it was a good and sturdy machine. I love it. I have several sewing machines and I can’t wait to try cleaning them. For years I have been taking them in one at a time for cleaning. Thank you for sharing this information. I have a 1970 (i think) Singer that I inherited years ago which I’m sure is alot stronger than my current brother computerized machine. Well except for the fact that it isn’t running..lol..but with any luck now that I know how to clean it ,it’ll be sewing again soon. Really good simple description of oiling a machine. Thanks so much for the pictures. Nothing like rejuvenating an old machine. I”m going to cleam my machines today! LOL!! 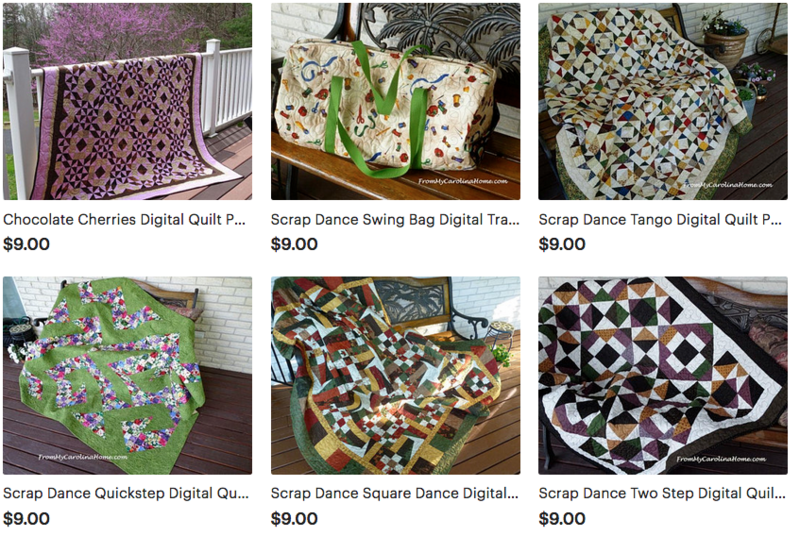 I just found your site and your experience with sewing machines is impressive! I have a question I wonder if you might answer. 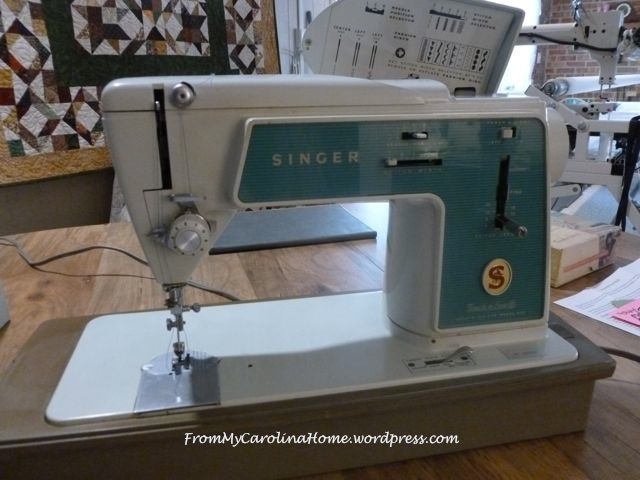 I have only ever used two machines: my grandmother’s old singer, on which I learned to sew, and a Kenmore 17124790 I bought in the late nineties. Well, I had the Kenmore in storage for about 15 years, and now I want to use it again. Unfortunately it turns out my storage area was accessed by dishonest employees while I was away from it, and they uncovered the machine, tracked in a lot of dirt and grime, and and left things exposed to the elements. I cleaned the machine thoroughly in the bobbin area, and when I saw how much dirt and dust had gotten in there I took off the bottom and carefully cleaned inside as well. There was a fair amount of dirt (small grains of dirt–not dust). I think it is now clean at least. Well, inside the bottom compartment under the bobbin assembly, you can see that it definitely needs to be lubricated before I use it. Whatever substance they put in there at the factory now looks like a gunky white or clear gel, and there is a lot of resistance when I turn the wheel. So, I was wondering what you think would be the best way to do it. Whatever was there was obviously more than regular sewing machine oil, as there is too much of it. It looks like it was some sort of thick, gel lubricant–even accounting for the fact that any oil will obviously gum up over time–just because of the sheer amount. It is on thick. I think I need to remove to this old gel substance and replace it, but with what? 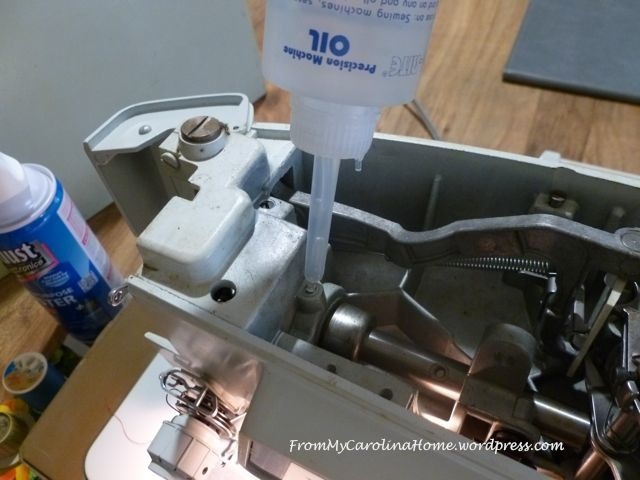 Can I use regular sewing machine oil, or is there a more appropriate, gel type lubricant for those interior parts? Thank for any advice you may have. Hi. I have an old Kenmore like the one shown on your site (73 – 74). It runs good, however the one set screw that attaches machine to cabinet is missing. Sears Web site no longer carries the item. 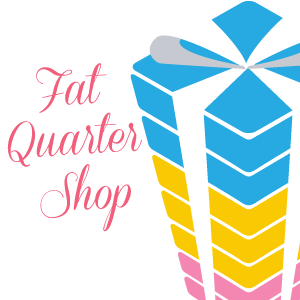 I have gone to hardware stores, sew machine repair shop with no luck finding one to fit. Can you help me? Any suggestions. I like storing my machine when I am finish using. By the way I like your post. Thank you so much for this post! My 1974 Kenmore started making horrible noises right before I needed it for my daughter’s wedding dress. Your cleaning/ oiling steps were just what my machine needed to be happy again. Thanks again.